Dr. Svetlana Jevrejeva, from the NOC, is the study’s lead author. She said: "More than 600 million people live in low-elevation coastal areas, less than 10 meters above sea level. In a warming climate, global sea level will rise due to melting of land-based glaciers and ice sheets, and from the thermal expansion of ocean waters. So, sea level rise is one of the most damaging aspects of our warming climate." Meanwhile back in the real world, Jevrejeva’s own research shows that global sea levels have been rising at a pretty steady 1.9mm/yr, with no acceleration, other than the effect of the slow down between 1960 and 1990. An entire fleet of junks have been launched, but still the believers in AGW rush to buy waterside property. In Australia Rudd, Gillard, Flannery for starters. I know of Gore and Suzuki in North America. Anybody know of other ‘sceptics’? Flannery’s house is in Sydney, my city. There is a tide gauge at Fort denison, Sydney. The tide gauge data shows a steady rise of about 100 mm in 100 years. The Sonel GPS shows a subsidence over 8 years of -0.33 mm/year. Giving about 70mm if you extrapolate the subsidence over 100 years. Not exactly something to be alarmed about. The biggest of all, UN Messenger of Peace (with a special focus on climate change), Mr Leo Di Caprio. I thought we knew all of this already? What is different about this, what is new and interesting? Is climate science really just about regurgitating the same stuff over and over again, with slight tweaks here and there? But no evidence that the rate of sea level rise is responsive to the rate of emissions. Similar stories emerged on Newseek etc. Sea level rise is esoterica, just like Arctic sea ice*. Should the rate of sea level rise jump by 3X, it would still have no discernible effect on humans. In fact, it would take ocean side dwellers years to even notice it. *Arctic sea ice goes up and down, year after year. No one would even know if we weren’t told. The headlines are always doom will happen, the articles are if this and that happen then doom may happen. 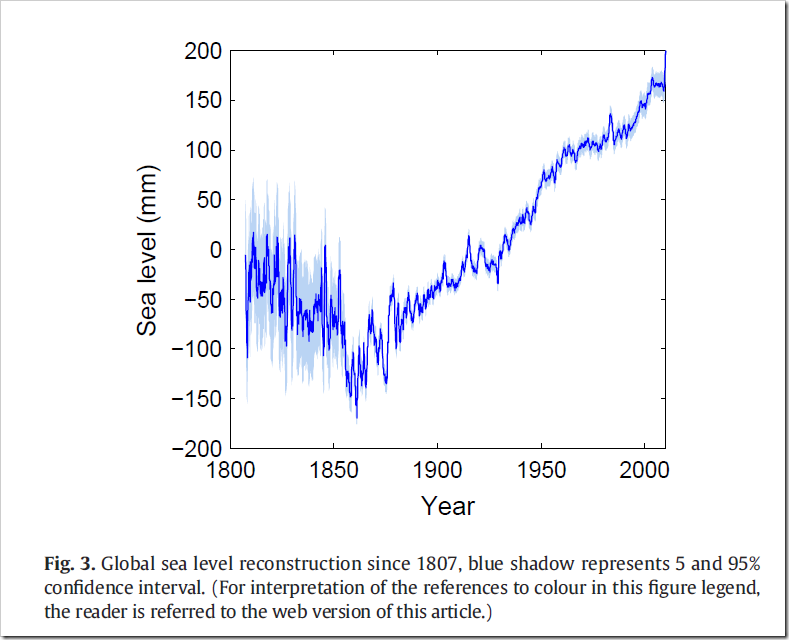 Does that graph of sea-level not show the LIA cooling of the oceans, and the very beneficial recovery from that very clearly as 1860 ? It seems that the LIA is not fully accepted by the Manns’ etc, as being worldwide, this seems to show it quite well (to me anyway). The “scenarios” that are missing are those that will tell us how to avoid all of this projected catastrophic damage, realistically. They are always couched in a scary scenario… “It’s real, it’s happening”… Act Now! “Project Fear” is alive and well and paid for by UK taxpayers. Someone should take Jevrejeva’s ‘Fig 3’ chart and plot his predictions of 0.52m (1.7ft), 0.86m (2.8ft), and 1.8m (5.9ft) — at the same scale. Thanks – a long day of travel – just saw it. 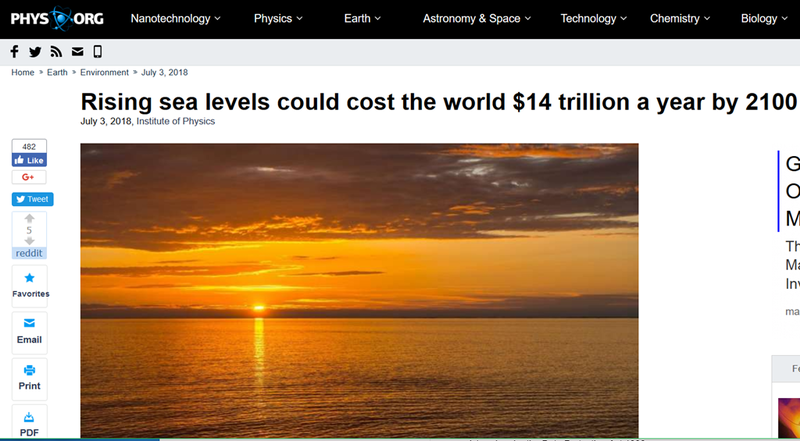 $14 trillion in 2100? What a horrendous price. Let’s pay $1 trillion a year to prevent that. So the next century is the new goal post and it’s closer than we think! If, and only if, humanity’s use of CO2 causes a temperature increase, the ONLY real reason to be concerned is if that increase evolves into a “run away” scenario, with a resultant existential threat to life on Earth. If not, who cares about warmer weather? Life adapts. If sea levels rise at a rate that we have not yet seen, that’s a problem for NY, Florida, Banglasdesh, etc. Its not a problem for the vast majority of life, which lives inland. Its not an existential threat. Its also not insurmountable, nor is it a problem that cannot be addressed in a matter of years. Could someone please explain to the Warmists that sea level rise is only a problem (in 300 years) to be addressed – its not an extinction event. Don’t these idiots realise that heat content is measured in Joules and you need a hell of a lot of them to shift the oceans even by a Celcius? If you can’t move the oceans you can’t move the atmosphere.